An integral part of Riebeek College was the bus service that transported most of the pupils, staff & locals in Uitenhage for many years. This company - Hennings Bus Co. was run by my great -aunt , Sylvia (nee Rudman) & her husband, Cecil Henning! I'm sure there are plenty of interesting stories that could be told about those trips to/from school, and about the eccentric, fascinating character who ran this service like a 'general marshalling his troops' - i.e. Sylvia!! 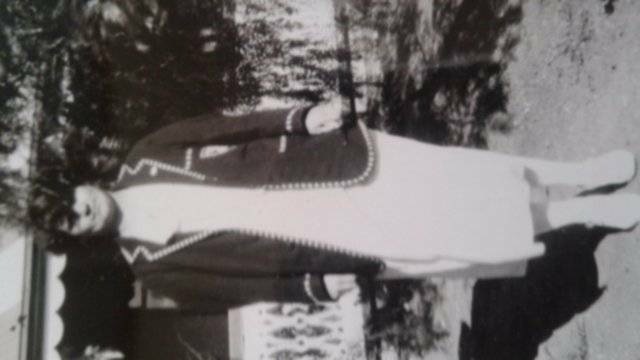 She is seen below in her school blazer - a pupil of Riebeek in her youth. The next photo is of her niece- my Mom - Zita Rudman/Van Rooyen who also attended Riebeek & was a border from a very young age. Those days the hostel was on the cnr of Cannon & Church Street. The photo was taken 1944/5. 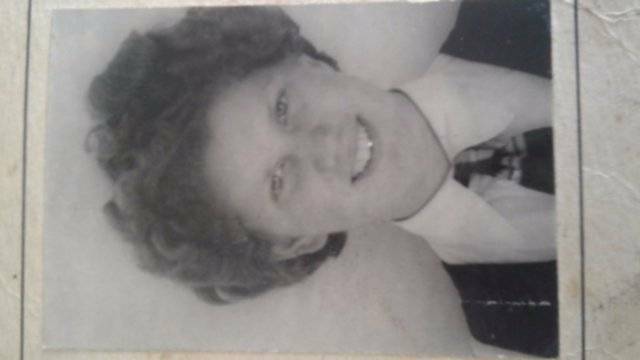 Needless to say - I - her daughter (Renee van Rooyen/Baard), matriculated at Riebeek in 1967! Thereafter, my daughter, Carine Baard, attended & matriculated here as well (1994). The 3rd photo is of my mom's sister- my aunt- Myrtle Rudman/Gouws (2nd from right, back row). 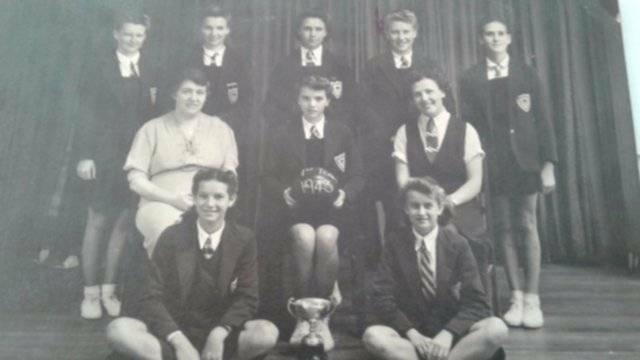 This was the netball team in 1943 - she was then in Std 6 & later wrote her matric in 1947! Myrtles' daughters - Beverley Gouws/Loenen, and later, Janis Gouws/Van Aardt attended Riebeek as well from Std 2 - matric. The list of cousins who originated from this Rudman family - farming in Karoo (Kleinpoort area) is extensive & too many to mention -( could probably fill a whole class, or two, on their own! )- and the girls/daughters all attended Riebeek College at various times. Carol Rudman/Dunn & her daughters, Vicky-lou & Melody - our cousins are but a few more I can mention. In fact, one of my previous teachers - Mrs Barnes-Webb - was related to us, & her daughters (Leonie & Sheila) are part of that 'tradition' as well! I am sure there must be other ex-pupils with a quite a list of family who went to our school, but feel certain that it would take a lot to beat our long line of 'history'! and did their school proud! I wish all those who have any history with Riebeek College - including staff - all the very best and congratulate Riebeek on their amazing contribution to educating generations of pupils - and 'opening doorways' & opportunities for them to pursue. “School is but a phase, albeit a very tumultuous and sometimes difficult one, so don’t let your schooling define the wonderful woman you can become. Strive to always better yourself and never measure your worth against others. DARE to be different, DARE to accept challenges, DARE to go out of your comfort zone. Better to be a complicated original than a simple copy. Remember to appreciate everyone who helps you along your life journey. Do things that make you happy, and are good for your soul. Don’t give advice unless asked for, and learn to listen. You are unique, you are special, and you are worthy. Our Class of ’67 celebrates its 50th Reunion at Founders Day this year. As part of a small but dedicated team working towards this occasion, I was given the portfolio of creating a poster which would be on display in the school foyer on Founders Day. What a trip down memory lane I had as all the photographs came flooding in from the Class of ’67. Class photos from Sub A to Std 10 – how wonderful it was to scrutinize all the girls and the Class Teacher for each year. Also of interest were photos showing the school uniform in 1967 (both the summer and winter version). Sports photos were sent in which included teams for netball, hockey, tennis and swimming. School dance photos which brought back memories of all the preparation work leading up to the actual event. Photos of an Operetta “Pearl the Fishermaiden” put on by the school in 1967. We have group pictures of our 20th, 25th, 30th and 40th class reunions. These were treasured times which gave us the opportunity of catching up with each other’s news and circumstances. Other pictures of interest which I received were of groups of Riebeek girls who attended the Hosking Ballet School which included girls taking part in shows/concerts as Glow worms, Brownies and ballerinas. What a privilege it was growing up in Uitenhage and attending Riebeek College. All the photos collated indicated how important a holistic approach to bold education is. I was the School Dux in 1967 but I do not remember there being stress or pressure put on me to gain academic recognition – there was always a balance i.e. a time to work and time to have fun. I have such wonderful memories of times such as rehearsing for our school operettas/plays which brought together so many girls of varying ages. This taught us about dedication and team work. Accolades go to the dedicated teachers and staff who fostered in us values such as responsibility, commitment and accountability. “Ora et labora” will always stand the test!